Jyotsna Patel will not open any mail. In fact, she will not even go near the mailbox at her home in Princeton Junction, N.J. She says she has been scared of it ever since the fall of 2001, when she came into contact with anthrax. Patel joined three other survivors of the still-unsolved anthrax attacks to mark the two-year anniversary Thursday of the mailings that killed five people and sickened 17 others. When Patel began to describe her experience, she managed only a few words before collapsing into tears and returning to her seat, where she was comforted by her husband. "It has been a very traumatic experience," said Norma Wallace, who worked with Patel at the Postal Service processing center in Hamilton, N.J.
Wallace, 58, told reporters she still suffers joint pain and fatigue, and will not return to work at the post office because her doctors determined she does not have the stamina to do the lifting required in her old job. Instead, Wallace is going back to school to become a teacher. The story is similar for Leroy Richmond, a 58-year-old worker at the enormous Brentwood mail processing facility in Washington, D.C. He contracted inhalation anthrax in October 2001. "Since that time, I think perhaps my life has been turned upside down. The quality of my life has truly changed," he said. Richmond said he will consider returning to his job only after receiving permission from his doctors. The road to recovery has not been as difficult for Ernesto Blanco, 76, the only one of the four survivors who has returned to work. "I feel fine," he said. 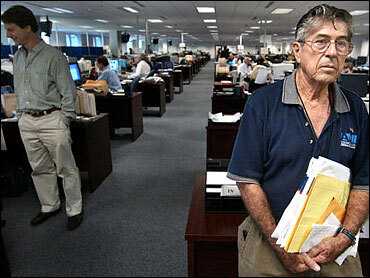 Blanco worked at the American Media Inc. building in Florida when he was hospitalized with inhalation anthrax. A colleague, photo editor Robert Stevens, died from exposure to anthrax. Four more deaths followed from letters containing anthrax that were sent to media outlets and the Capitol Hill offices of Sens. Tom Daschle, D-S.D., and Patrick Leahy, D-Vt. The powder-filled envelopes sent fear through a nation already shaken by the Sept. 11 attacks and left people worried about their mail. Postal facilities closed, as did office buildings on Capitol Hill, where hundreds of lawmakers, staff members and others were tested and given an antibiotic. At the Brentwood facility, two postal workers died from inhalation anthrax. The Centers for Disease Control and Prevention reported Thursday that no additional deaths at Brentwood were caused by the attacks. The CDC looked into the issue because the mortality rate was unusually high among workers at the facility in the months after the attacks. Inhalation anthrax, which is far more serious than cutaneous anthrax — the skin form of anthrax — is caused by breathing in spores of the bacterium, Bacillus anthracis. The FBI continues to investigate the attacks, but has yet to arrest or charge anyone. Much attention has been focused on Dr. Steven J. Hatfill, a bioterrorism expert described by Attorney General John Ashcroft as a "person of interest" in the investigation. Hatfill has denied any involvement in the attacks and has sued the government, alleging that his reputation has been damaged. He has never been identified as a suspect not charged with any crime.